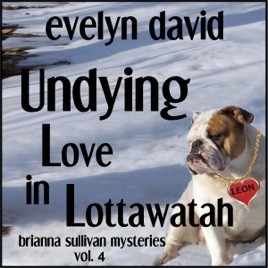 Undying Love in Lottawatah is the fourth audiobook in the Brianna Sullivan Mysteries series. A novella-length story, Undying Love in Lottawatah continues the saga of psychic Brianna Sullivan who planned to travel the country in her motor home, but instead unexpectedly ended up parking her home on wheels in a small Oklahoma town. In Undying Love in Lottawatah, as Valentine's Day approaches, Brianna is hired by the local police to help solve an arson/murder case. She's also got family problems. The ghost of her great aunt keeps pressing Brianna to find out what happened to Harry, her long lost love. In her spare time the reluctant psychic tries to figure out her own love life and her relationship with Detective Cooper Jackson. Is he reason enough to stay in Lottawatah?